You’ve gotta hand it to Korg. …they like developing NEW products, rather than dredging up names and model numbers that evoke their old classics in a bid to cash in on nostalgia. When other manufacturers go one way, they go another, and the result is usually way more interesting. They pioneered the “cheap, hand held analog synth” with the Monotron. They even took lead on producing their own virtual versions of their instruments (Korg Legacy Collection) instead of being worried about devaluing their old flagships. Most importantly, they like developing NEW products, rather than dredging up names and model numbers that evoke their old classics in a bid to cash in on nostalgia. When they do go to their back catalog of classics, they just straight up release versions of the originals again, giving people access to gear at a price a fraction of what collectors or Ebay vultures charge. All in all, I’m consistently impressed. So what the heck is Gadget then? 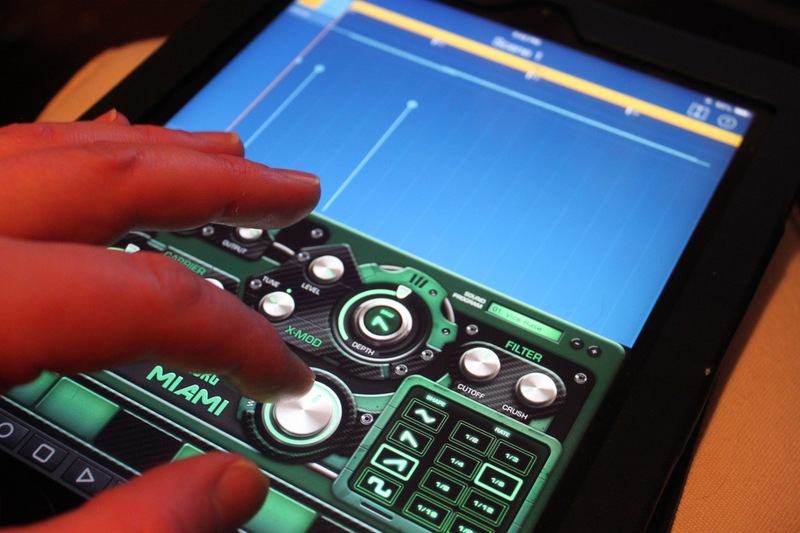 Gadget is the new synth suite / mini DAW / drum machine / sketchpad for the iPad that dropped at NAMM 2014 with little to no lead up in promotion, and hit like a ton of bricks. No big teasing over thought product launch, just straight up “here it is,” and it’s really QUITE good. Gadget is a different beast than we’ve really seen on the iPad before. It’s not a single synth like the iMS-20 or the Arturia iMini, but rather a “suite” of mini-instruments tied together with a fairly robust sequencer (by mobile standards anyway). There was no skimping on this collection, with 15 total offerings. 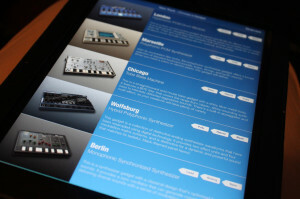 Instead of taking the approach of one instrument doing everything, the “Gadgets” allow the entire app to function as a sort of audio swiss army knife, with specific instruments filling specific roles. London is the suite’s main percussion contribution. The samples are better than expected, bordering on excellent to be honest, and there is a good amount of dynamic optimization to make sure you can get appropriate thwack out of your main elements. Chicago is essentially a 303-style emulator. This Gadget includes some pretty nice onboard effects as well as a built in tube overdrive simulation. A nice arpeggiator and scale selection actually allows for the rapid creation of some pretty inspired acidic hooks. I’d buy this alone as a VST/AU instrument. Marseille is basically a sound bank of the essentials. Piano samples, string samples, etc. Really this is a utility module used to cover a lot of bases. Not the most interesting but a necessary inclusion. A built in chord function expands its repertoire a little. Brussels is optimized for big detuned leads and is a go to for big electro-anthem style leads. Doesn’t sound bad actually, but not my bag personally as I tend to think this type of sound is pretty overused. A good amount of depth though for sure. Kiev is a vector based synth, and for those who haven’t played with vector synths before, you’re in for a treat. They are GREAT for specially intricate drones. This guy is a lot of fun. Phoenix – with its Oberheim style front panel, this polyphonic virtual analog is a nod to the OB-8 etc., and fills the role nicely. Big 80s style leads and chord sounds abound, and it’s not a slouch for bass sounds either. Dublin takes us back to a familiar Korg lineage. It’s like a little second cousin to the MS-20 series, with a degree of patchability and modular style controls. Pretty deep for part of a 15 pack if I don’t saw so myself. This one will look after all your weird bleeps and bloops. Miami I expected to dislike, but once I got over the lowest common denominator graphics and styling, I was impressed. It was bound to show up somewhere – this Gadget is the “wobble synth” that will probably see a ton of use. Designed to help easily produce dubstep style basstones, it actually sounds pretty darn good, and the LFO sync automates REALLY well. Tokyo is an interesting inclusion but a welcome one. It allows for some really cool adjustments on analog style percussion sounds. Think 808 style controls on pitch, etc. and you’re in the ballpark. Pretty flexible and damn if I don’t love some distorted analog toms. Designed to produce tearing hard sync leads, this is a tiny beast. Funk abounds. Wolfsberg allows for digital control of analog style sounds. I mean – this is ALL digital control, but in this case, the analog waveforms have been optimized in a nice unit with tons of modulation capabilities and a pretty deep sound. Not one of the go-to’s per se, but a nice Gadget nonetheless and capable of some really nice sounds with its additional envelope and effects. Berlin – now we’re getting into some interesting stuff. Designed to produce tearing hard sync leads, this is a tiny beast. Funk abounds. Helsinki could well have just been called Boards of Canada. An ambient synth, it combines great waveforms with really nice sounding reverberations and some chipset style degradations. Melodic and deep. Chiang Mai utilizes VPM – or Variable Phase Modulation – and is a cousin to FM in terms of sound. Great for clangourous tones and metallic elements, this Gadget works for 80s leads or even some intricate, high harmonic bass tones. Korgs work with VPM in other synths has produced a really easily workable high timbre sound source. Kingston is a wicked little chiptune Gadget, capable of video-game style leads and effects, and is heavy on the lo-fi digital vibes. Total essential. In a nod to old school hardware seq’s like the Alesis MMT-8, Gadget allows you to build patterns for each different instrument in use. These can be programmed via hunt-and-peck, playing the keys of the “gadgets” or external midi controller. To be honest, the editing of the piano roll is the single best incarnation of a revision process I’ve encountered on the many iOS music apps I’ve tested, meaning you can really write on this thing. Click and hold your finger to draw a note, click again to delete em. Easy. In addition, you can overdub automation into your roll, and edit the automation after the fact in a manner that Live aficionados will instantly understand. The thing even has a “freeze” function for freeing up CPU. The arrangement process employes decent if not intuitive copy and paste functions, allowing for pretty rapid arrangement of “scenes,” which can be played back in a linear fashion or looped. It’s not bad at all, and feels pretty much like relatively robust tool to work with. Cheap for what it is. Great sound, tons of options, lots of fun. A no brainer for a sketchpad while travelling or just experimenting with some pretty cool tools for the price of a case of beer. I really wish there were more options for global effects. Basically each Gadget has optimized effects contained within each device – sort of limiting. Somewhat CPU heavy; even though you HAVE 15 Gadgets, don’t expect to use them all at once. All my other limitations would be just based on the iPad platform, and so are a little trite. Korg have produced a winner. I’d say that you’re not going to be producing a number one hit on this thing, but then, Peaches produced her first album with an MC-505 so who am I to judge? It is, however, a LOT of fun, and that’s clearly what the goal was with it. 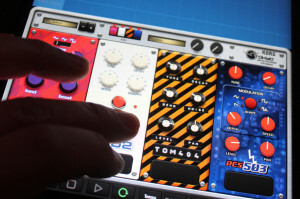 Korg took the same approach with the original Monotron, putting cheap real analog sounds in the hands of many for under a bill, so I think this app is destined to be a future classic.